Over the last forty years, many Sebago residents have generously donated items of historic interest to the Society. We now hold a sizeable collection of books, photographs, scrapbooks, tools, household items, clothing, locally-built boats and many more objects relating to life in Sebago. Artifacts representing early schoolhouses and churches, as well as important community organizations such as the Grange, are well represented in our collection. We also maintain genealogical materials and records of family history about many Sebago families from the earliest settlement days to the present time. Our collection is housed in the Society's building on the Convene Road and in the shed beside it. 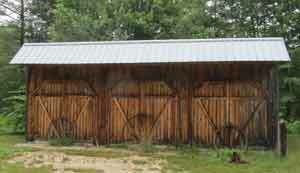 The shed was erected in 2002 by local builders who donated their time in the barn-raising tradition to make extra display space for large items. The collection can be viewed on the 2nd Saturday and 4th Sunday of the months of June, July, and August, when we hold open houses at the museum. It is also possible to meet someone there at other times by appointment. Please email us at contact@sebagohistoricalsociety.org to make arrangements. If you have items you wish to donate, please fill out the Donation Form and email it to us at contact@sebagohistoricalsociety.org. Unfortunately, our limited space and storage capacity means that we cannot accept all donations. Items with unusual or important historical significance are especially welcome. Thank you!